BMW is at CES this week demonstrating some of its newest advances in the field of highly autonomous driving. If you remember, last year we were taken to the Las Vegas Motor Speedway and sped around the track in a tricked-out driverless 4 Series. This year's theme remains essentially the same, though rather than focusing on high-speed driving and drifting, the German automaker has slowed everything down. We were invited to a hotel's rooftop parking area where a couple BMW i3s were parked at either end of the space. One would demonstrate 360-degree collision avoidance and the other fully automated parking. They both did a very impressive job. Both i3s were equipped with four laser scanners: front, rear and one on both the left and right front-quarter panels. Using the scanners, the car is able to create a temporary map of its environment; picture a box extending out from the car on all sides. Once it drives past an object such as a pylon or a giant block -- and there were many on hand, like real-life Minecraft blocks -- they're remembered for a time. For the second run, I kept the pedal hard against the floor, but we still stopped at the same smooth pace. The experimental software and hardware at play know the precise shape of the car and where it is in space. If any part of the car is in danger of hitting any obstacle, the system gently, but insistently stops the car. Of course, the system can also be overridden in a pinch -- for instance, stomping on the pedal will force it into motion no matter what. In our first test, we drove straight toward a giant block. The BMW rep with me in the car told me to just keep my foot in it and the car would stop. It did, but with the center stack's proximity alerts howling and mostly red. We then did the same exercise, but in reverse. For the second run, I kept the pedal hard against the floor, but we still stopped at the same smooth pace. 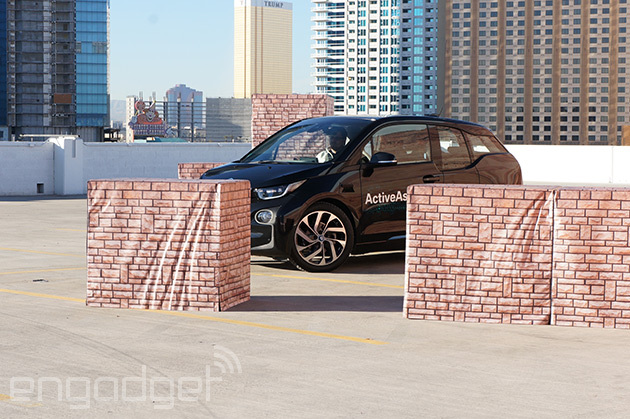 The rest of the demo saw us circling a rooftop outbuilding attempting various maneuvers to see how the i3 would react while parallel parking and trying to deliberately knock a mirror off. The proximity sensors, while useful in low-speed driving, are mostly useless at speeds greater than a parking pace. To demonstrate this, our last run at the blocks was from a much greater distance and the system stopped as before, but this time without the proximity alerts wailing. The other i3 on the roof was sitting next to a valet parking sign. Using the same scanners as the 360-degree collision-avoidance system, the fully automated parking demo also adds maps to the mix. GPS might work well in a rooftop parking area, but once you head below ground, GPS goes away and our car would be stopped and stranded. BMW's solution is that the cars be supplied with detailed maps of the parking area so that they can both orient themselves to find the entrance or exit and help select a space to park. It's sort of like making dinner -- we'll always want the potatoes; we just won't have to do the peeling anymore. 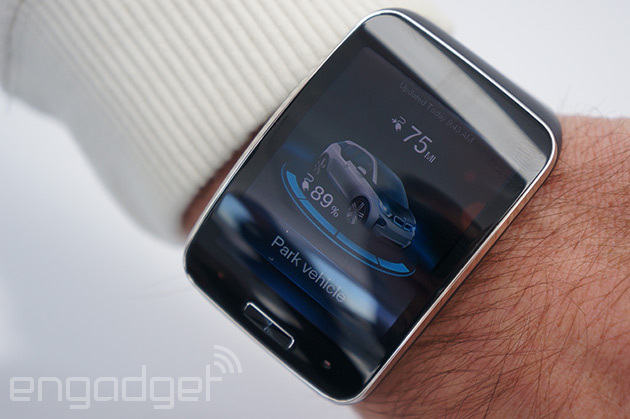 We hopped in the back seat of car and the BMW tech produced a ZenWatch running a BMW app and tapped the "Park Vehicle" button. The car did a quick 180-degree turn and off we went to find a spot. After a few hundred feet, the i3 chose to back into a spot between two other BMWs -- of course -- and did it perfectly. Retrieving the car was done exactly the same way using the app, but this time the car pulled out and headed back to where we left it. The experience of sitting in the back seat of a car as it drove itself about was pretty unsettling at first, but we quickly forgot about that and just enjoyed the drive. We'd buy these systems tomorrow for our cars as an aftermarket add-on or bundle them in our next new purchase in a flash. The demos -- yes, they were in a controlled environment -- were that compelling. But unfortunately, this gear is being built, designed and tested in lockstep with BMWs vision of the Highly Autonomous car. This was the carmaker's way of telling us it wasn't coming to the next-gen i3 or any other model in the current lineup. Instead, these are small steps in a much larger vision of how vehicles will interact in all manner of different driving situations. Eventually, BMW hopes they'll form a complete and safe automated-driving experience. Again, to be crystal clear, we love driving, but give me the option to read mail instead of mindlessly drifting in traffic and I'm on board. Drop my car off and let it park itself while I get my groceries and then meet me at the curb for a pickup? Yes, we'd line up for that! It's sort of like making dinner -- we'll always want the potatoes; we just won't have to do the peeling anymore.